DO YOU KNOW HOW TO CATCH A FAIRY? GO AHEAD & GIVE IT YOUR BEST SHOT!! Do you believe in fairies? Have you ever seen one? What do you feed them? How often? Do they sleep in a bed? On a hammock? Are they real? Are they related to elves, gnomes and leprechauns? Have you ever seen a male fairy? Why, all of a sudden, this interest in fairies? 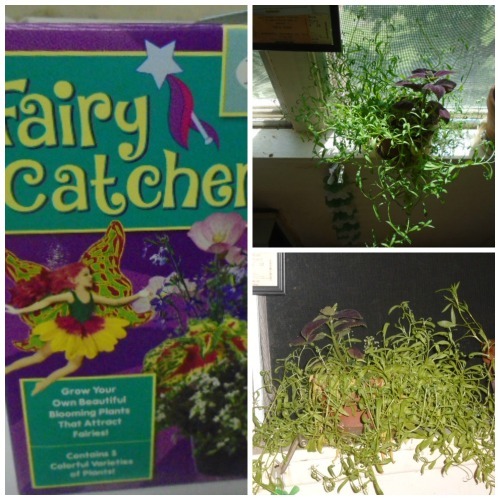 In November I went to another Dollar Tree store and on one of the shelves there was a box labeled “Fairy Catcher Kit” that said “Grow your own beautiful blooming plants that attract fairies”. It has a decal, a germination disk, a fairy mix seed pack for growing 5 blooming fairy plants!! It also says “Each of these plants has an enchanting history. Many people throughout the ages have believed that these flowers can lure fairies to their gardens, make potent potions and keep humans safe from mischievous magical creatures. Now you can grow your very own fairy garden and catch your own fairies”! It is now 4 months later and I haven’t caught any fairies---yet!!! I think I may have seen a couple at my Leap Year dinner party but didn’t catch them on all the photos that were taken. The plants are growing beautifully so maybe in a month or two I’ll have a few fairies living with me!! !